Quickly separate audio and video tracks from video while keeping the original audio and video quality. The best way to separate audio and video tracks from video is to use a video editing program. 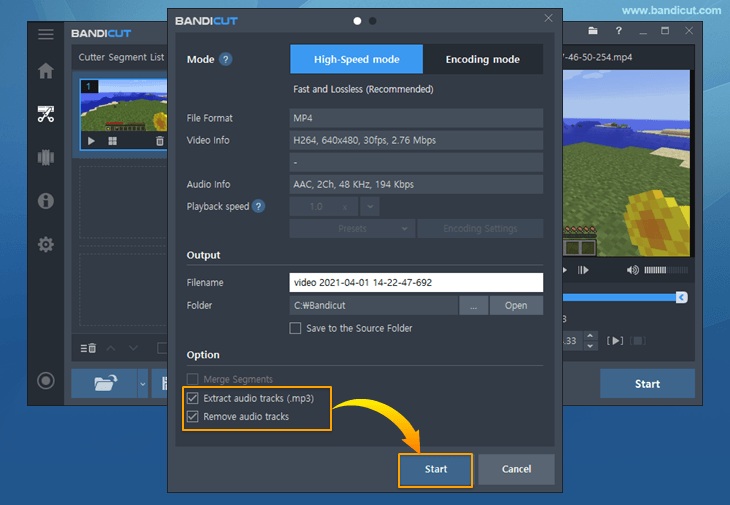 There are many video editing programs out there but we recommend you use Bandicut because it allows users to separate audio and video tracks from video while keeping the original audio and video quality. 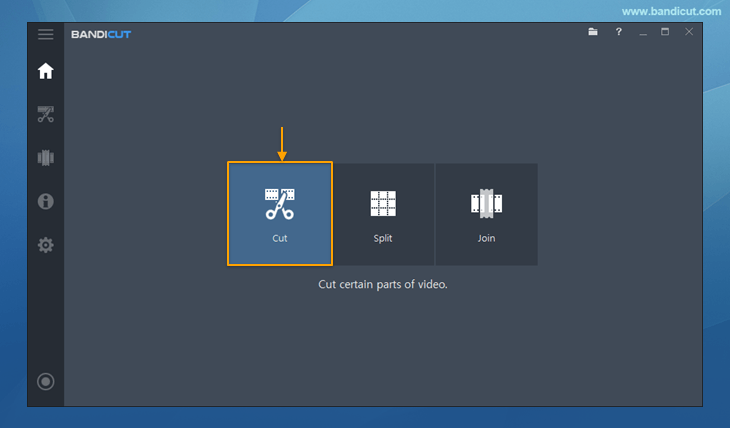 Bandicut is an easy-to-use video cutter and audio separator software for Windows. Users can extract audio from video to MP3, remove audio tracks from video, trim parts of video, or split the video into multiple files. Please download the setup file from the official website of Bandicut to separate audio and video tracks from video. Download the free version of Bandicut, start Bandicut, and then click the "Cut" button. 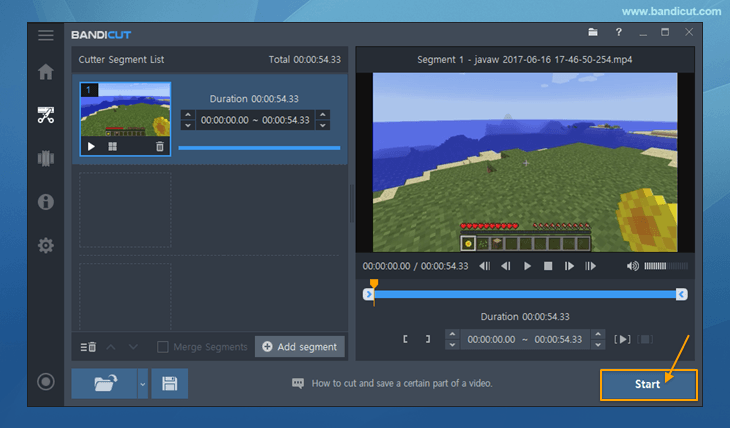 The free version of Bandicut allows you to separate audio and video tracks from video without converting (re-encoding). Open a video file that has both a video and audio track, and then click 'Start'. You can add any video files (Input video formats: *.avi, *.mp4, *.mov, *.m4v, *.mkv, *.webm, *.mpeg, *.mpg, *.dat, *.vob, *.flv, *.asf, *.wmv, *.ts, *.tp, *.trp, *.mpe, *.mpv2, *.mp2v, *.m2t, *.m2ts, *.k3g, *.divx, *.wm, *.wmx, *.wvx, *.rm, *.rmvb, *.ram, *.ivf, *.ogm, *.vp6, *.xvd). Check the 'Extract audio tracks (.mp3)' and 'Remove audio tracks' options and then click the 'Start' button. With [High-Speed mode], you can quickly separate audio and video tracks without decreasing the audio and video quality. If you use the [Encoding mode], it may take some time depending on the video length and format. Your video clip will be split into a video part and an audio part. You will now get new audio and video files which are generated from the original video file. Use it however you want.